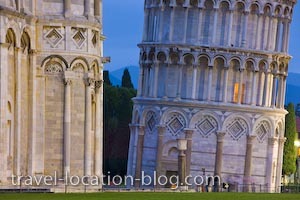 Picture of the details of the famous Leaning Tower of Pisa and Duomo in the city of Pisa, Tuscany, Italy. and Duomo in the Tuscany, Italy. The base of the famous leaning tower of Pisa and Pisa Duomo at dusk in Piazza del Duomo (Campo dei Miracoli), a UNESCO World Heritage Site, City of Pisa, Province of Pisa, Region of Tuscany, Italy, Europe.